A secure Identity and password manager which can retain all your personal information relating to usernames, passwords, pins, login details and account information etc. ID_Bank is able to retain all your personal information relating to usernames, passwords, pins, login details and account information etc; the sort of information you often forget or write on scraps of paper that anyone else can read! ID_Bank will store your information in secure encrypted files (using the Rijndael encryption algorithm) Start-up ID_Bank and enter your file password and you have access to your data. You are able to configure ID_Bank to display your data in a format you prefer, blocking key information from casual display and ID_Bank will hide itself when not in use, prohibiting unauthorized access. Store your passwords and ID data in named files, you are not limited to one file that must contain all your data. Your data is encrypted using the Rijndael 128 bit encryption algorithm. Group your data into categories. Fully customizable display to suit your requirements. Quick access to the Password Popup Box available on demand. Fast transfer of password/username to other documents or web pages using Copy/Paste or Drag and Drop. Auto hide and password protect ID_Bank when Idle. Clipboard auto clear when idle. Preview and print reports of your data. ID_Bank can retain all your personal information relating to usernames, passwords, pins, login details and account information etc. Your data is encrypted using the Rijndael 128 bit encryption algorithm. Password Saver (Business) - A wonderful and secure password solution of storing business account and password for business operation! Password Saver (Personal) - Rich feature solution to store your password, organize, add and edit password records in security and centralization! 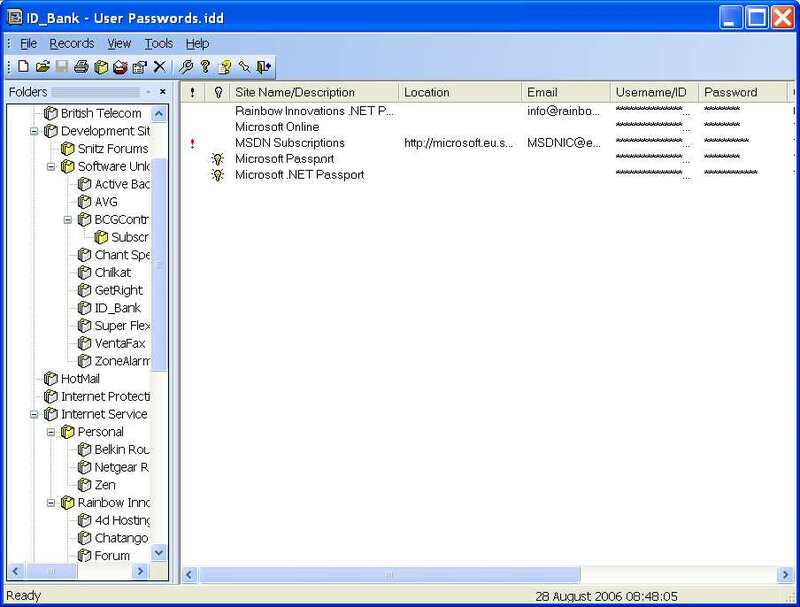 Hotmail & MSN Password Recovery -Recover the stored or saved password to the Hotmail and MSN Messenger account on your local computer. ICQ Password Recovery - ICQ Password Recovery can recover ICQ passwords for all versions of ICQ. MS Backup Password Recovery - MS Backup Password Recovery is able to recover passwords for protected MS Backup (*.qic) files.